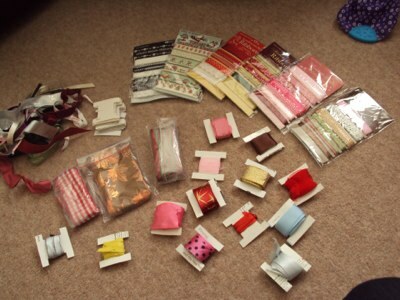 As you can see from my picture, I have started to tackle the notorious ‘ribbon stash’. I am, what one might call ‘a bit tight’ and so I don’t like to spend money where it isn't required to be spent. Ok, ok so I know that there are some packs of bought ribbon there as well but generally I take ribbons off of all manner of things; gifts, chocolate boxes, clothes etc, and keep them for ‘that thing that I am going to make’ but they just end up stuffed in a bag. I know that you are feeling this too. I do it with all sorts. I collect pretty papers and wrapping, buttons and beads etc. Hubby B hates it. I’m sure all of you crafters have someone in your life telling you to throw it all out, but every crafter has a stash and it is much better to collect than spend! Truly homemade. This habit of collecting things left, right and centre is probably what deters me from starting and finishing a project. I have to find, in mess, something to work with. wouldn't it be great to pick up a box of generally tools, a box of ribbons, some fabric etc and just....go? So this has been the project that I have been concentrating on this week. Project SORT OUT CRAFT ROOM! I have tidied and organised, thrown out, made things to store other things and while I am still not done completely, I now have I very tidy sewing box, an organised tool box, an amazingly snazzy looking paper box, and half organised ribbon stash. I have also managed my time well enough to get a few things done on the craft front. Remember in my last post I suggested I would be thinking about what we could achieve in one hour? Well here goes. I am well into getting my secret crochet projects started. One hour saw me start one of the projects and complete 6 ‘rounds’ of a second one. Oooo is that a clue right there? And remember those leaves that I collected from St James Park? I hydrated them over night (it took me 60 seconds to place them on a plate with some water and stash it somewhere safe) and used them to print some scrapbook pages. Finally! One hour. And there might be something in this printing malarky. I also got to journaling in my project book, doodling some ideas, planning etc. One hour with a cup of tea whilst baby napped, saw me plan my next 3 projects. Another hour, along with a stand-up DVD with Hubby B and Sister B (along with some help with from the latter) resulted in some homemade card ribbon holders. Another hour, post Sunday lunch, gave me enough time to wrap and pin some ribbons around the holders. The movement of my arms was as much as I could muster after the yummy sausage and mash in a plate sized yorkshire pud, made by Sister B.
I’m in the process of developing my website so keep coming back to check on the progress. Who knows what you might find. Well, back to the madness of a Monday.